Kels takes Mosport with fastest practice, pole and race win.. then we broke her. 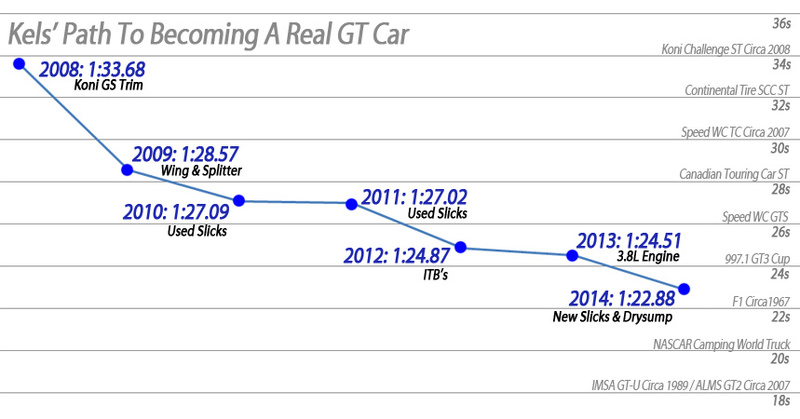 Kels is really growing up to be a true GT car, and she wanted to prove it. 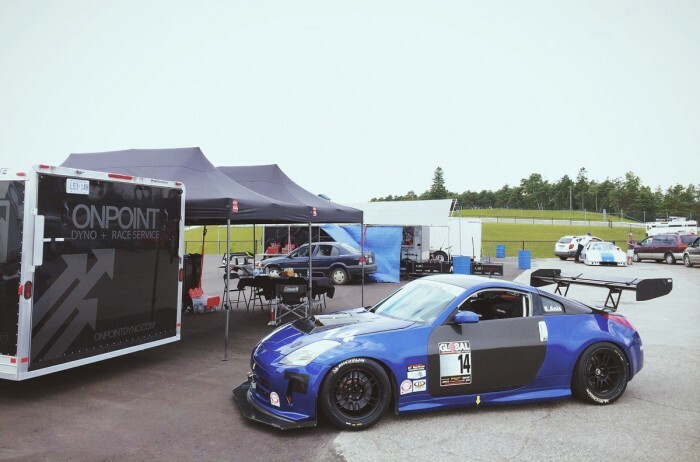 We brought the car out to Mosport for a regional race after her long sleep since Global Time Attack – Road Atlanta. She came out of the box flying with a 1:24.2 on the second practice lap of the weekend, with a similar setup to the one run at Road Atlanta. It was a cool morning for the practice session and the 24 came incredibly easily – besting her previous record time by 3 tenths without even trying. The reason for the speed is likely the tires and setup as not much else has really changed – the weight reduction from the carbon panels was more or less offset by the added weight of the dry sump system. Although I must say the longer splitter and fences certainly helped with front downforce. For qualifying I really wanted to put in a 23, and knew Kels had it in her. What I didn’t know was that she was planning on doing a 1:22. Kels told me to slam gears, smash curbs and power early. Being an obedient slave I did as Kels asked and a 1:22.8 popped up on the dash on lap 2… a lap that started with me in the dirt on the outside of the corner 10 exit passing two other cars. Who knew she was such an animal! Needless to say there weren’t any proceeding laps as I was just staring at the dash in disbelief all the way through corner 1. It is very difficult to get clean laps in during a regional event and it’s lucky I was able to get it done when I did because there was a ton of traffic on the next lap. The faster the car, the more traffic! The car felt great too. No more aero understeer that was killing the car’s high speed performance last year. the DJ dual element wing is huge but we were able to balance out the front with splitter fences and lower front ride height, as well as a splitter extension. 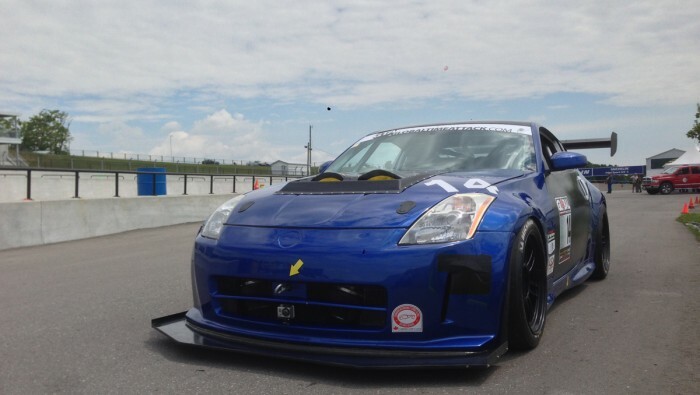 The front splitter on the car is nearly 4″ long in some sections! In fact the car makes so much front downforce that it is now slamming the splitter into the ground under heavy braking at high speed. At low speed, the car doesn’t have the grip to put the splitter in the ground. Cool! We actually have enough front downforce that I can no longer run the wing fully trimmed out – which is a pretty dramatic change from last year where I wanted to remove the flap from the wing there was such a large aero imbalance. You can see from the above data that the car was rotating significantly better and allowing for more entry speed AND more exit speed out of corners 2, 3, 8, 9, and 10. The fresher tires helped with that no doubt as well. You can see how weak the run on to the front straight was as a result of the traffic that I had to pass on the dirt. Interestingly the car has no straight-line advantage, the top speed is more or less the same as when the car did a 1:24.7 with the 3.5L engine. Most likely this is due to the knock-back springs and additional drag from the larger wing and splitter. You can see the rebuilt clutch has slightly helped shift times. Car prep for the race was fairly straight forward as we had only done 5 or so laps to this point, so we loaded her up with fuel and went out for the race. The regional events are usually fairly busy compared to a pro weekend with practice, qualifying and a race all in one day. With the level of prep and inspection we do after every session it means everyone on the team was working at full capacity the entire day. 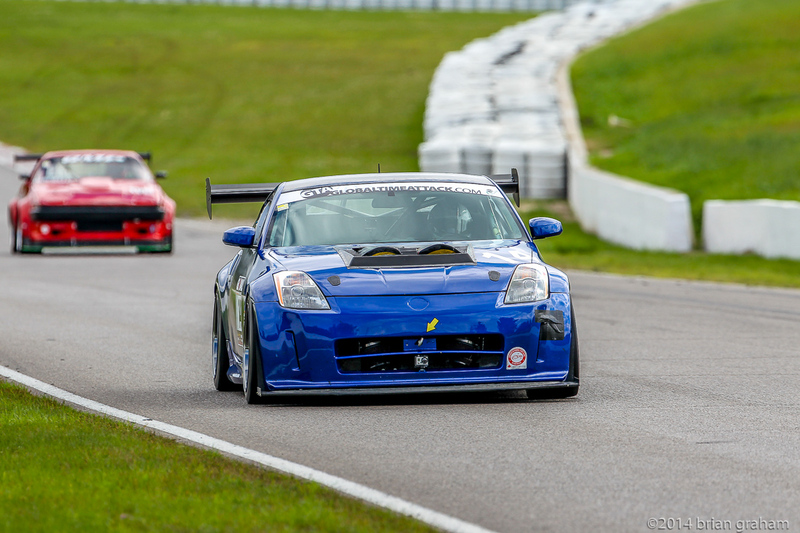 When you have a car that runs 1:22’s at Mosport you need to check it over every time it comes off the racetrack. No exceptions. Lined up early. Waiting for party. We lined Kels up ahead of some very impressive machinery and I couldn’t help but take a moment to enjoy my new 3D printed steering wheel controls, the new suede Sparco wheel and the beautiful Motec MAP position switches that allow me to fine tune traction control and engine maps on the fly. Needless but awesome details that re-affirm my opinion that Kels is becoming a real GT car. The big powerful Merkur got a strong jump on the start but I was able to stay inside him for corner 1 and get a strong run out of 2, 3 and through 4 so that he was not able to make a pass on the back straight. I’m not sure what happened to him but he had some sort of mechanical failure at which point we were mostly out on our own navigating traffic. After about 15 minutes Kels started throwing me fuel pressure warnings, similar to the issues we were having at Road Atlanta. We would later realize the issue was the lift pump filters were clogged from debris and unable to fill the surge tank as quickly as Kels’ heart was consuming the fuel. If you can imagine a 4 litre jug full of liquid that slowly leaks out more liquid than is being filled – that was our situation. It will be able to go some time before the jug is empty as it is only slowly consuming more than it is receiving. In this case it ended up being about 12 minutes of hard running before that jug was empty (the surge tank) and the only way to get the surge tank to re-fill was to literally only apply half the power in the straightaways. Thanks to some tricky engine mapping the engine will run quite well as long as it has some level of fuel pressure – I have programmed the injectors to open up dramatically as fuel pressure drops, so that in these kinds of cases the engine doesn’t go terribly lean. Of course this only can work until the injectors are wide open – which they were – and of course the fuel pressure was still dropping! I started driving around watching the dash and keeping the thing at a safe air fuel ratio without pushing my luck. Something terrible then happened. 3 cars crashed into a huge cloud of Days Of Thunder ‘esque smoke on the back straight. Harry came on the radio and told me to drive through it, but I knew better than to take his wreckless hillbilly advice. I slowed down and 3 cars appeared through the smoke and were wrecked pretty hard.. This sad event worked in our favour and allowed Kels to re-fill her swirl pot and bring home the win. On to Race 2! Race 2 started well and we had a strong gap on the rest of the field by the end of the opening lap. Unfortunately the fuel pressure issue returned despite having thought we had it fixed. As if that wasn’t bad enough – I managed to mis-shift and lock up the rear tires entering corner 9, going into a rather fast and violent slide. The whole event was nasty enough to break an axle in fact! So with the car crab-walking down the straight with one driven wheel and fuel pressure problems, our race weekend was over. The only thing I was mad about was my mis-shift, and even that couldn’t bring us down from the high of doing a 1:22 at Mosport. That has been the magic number for some time as I used to look up to the SPEED World Challenge GT cars that used to race around Mosport doing those seemingly un-comprehensible times many years ago. The goal for Kels however remains a 1:18 – the time of a pole setting ALMS GT2 car circa ~2007. We have only 4 more seconds to go.. and have already come 12 seconds from when I first received the car. One thing that should certainly help shave some time would be a sequential gearbox, and I am happy to report that a MakTrak gearbox is on it’s way from England for Kels. MakTrak produce the gearboxes seen in Ken Block’s Gymkhana videos among other rally and road race cars. I will be sure to post updates as Kels takes this next major step to becoming a true GT car. I have to thank everyone that came out and helped on the weekend. Old friends and employees of SG all came and impressed me with their attention to detail and work ethic as they always do – I wish I had the means to employ them all and take over the world. These guys are some of the best dudes in the industry and I am proud to see them all working hard and being the best at their respective positions. And of course thanks to my fiancée Nicole for supporting and feeding us all weekend!